T WAS the perfect conclusion to a flawless campaign. As the final whistle blew in Iran’s 2-0 victory against Uzbekistan on June 12th, the home side’s World Cup qualification record read: 16 matches played, not a single loss, 34 goals scored, just three conceded—and a place secured for next year’s tournament in Russia, making them only the second side (after Brazil) to do so. The crowd of 60,000 spectators at Tehran’s Azadi Stadium was smaller than usual, with security tightened after an attack on the parliament by Islamic State on June 7th. But throughout the qualifiers Iranians have thronged to the ground to watch their beloved “Team Melli” vanquish all and sundry. Attendance at their previous home game, in which they beat China 1-0 on March 28th, exceeded 100,000 (the size of the Nou Camp, European football’s biggest arena). Fans perched on the perimeter walls, hoisted themselves onto the scaffolded floodlights and even dangled from the billboards from which the Ayatollahs Khomeini and Ali Khamenei gaze down upon proceedings (pictured above). The Chinese, who want to become a footballing powerhouse, can only look enviously at Iran’s triumph. Encouraged by Xi Jinping, the president, clubs in the Chinese Super League have spent heavily on attracting foreign talent. But the national team remains weak, languishing at the bottom of its qualification group after drawing with war-torn Syria on June 13th. Iran, meanwhile, are the best side in the Asian Footballing Confederation (AFC). FIFA’s official rankings put them 30th in the world and first in the continent; the World Elo ratings (a more accurate measure of team strength) has them 20th. They are the only Asian side to remain unbeaten in World Cup qualifying and their appearance at the 2018 edition will be their third in the last four tournaments. Might they offer a template for China of how to dominate the continent. Not really. Iran’s success appears to be in spite of its national attributes, not because of them. Indeed, after controlling for population, wealth and player experience, author Simon Kuper and economist Stefan Szymanski found that Team Melli was one of the most over-performing international sides between 1980 and 2001. The country is certainly much poorer than its local rivals: its GDP per person is less than half of that for Australians, South Koreans or the Japanese. When it comes to size, Iran’s 80m inhabitants leave it a way behind Japan (127m), not too far ahead of South Korea (52m), and dwarfed by China (1.38bn). In terms of talent, the primacy of the sport should give it an edge: Australia’s most gifted athletes are usually pinched by cricket, rugby or Australian-rules football, whereas baseball and basketball are hugely popular in South Korea and Japan. Iran is famed for its weightlifters and wrestlers, but football is the only team sport in town. Still, that advantage doesn’t seem to count for much. Its domestic league is weak, ranking seventh in the region, with only a pittance spent on transfers each season. And where once Iran exported several players to Europe’s best leagues, today it sends hardly any. A decade ago, the majority of Team Melli played in one of the “big-five” divisions—those in England, Spain, Germany, Italy and France. This season only one, 30-year-old Ashkan Dejagah, has earned his keep in such an illustrious competition. Though a few play in lesser European leagues, even the most ardent Iranian fans would agree that their side is lacking in world-class players. That will not stop them celebrating their team’s ascendancy on the continent and qualification for the sport’s grandest event. Yet that is also a reflection of the weakness of Asian football. More damning still, another of the AFC’s four automatic qualifying spots is occupied by Saudi Arabia, a country that has never produced a player with experience of a big-five league. History suggests that Iran’s thin squad will run out of juice eventually, since teams with no European representatives have struggled to stay in the Elo top 30 (see chart); Saudi Arabia are currently ranked 54th. 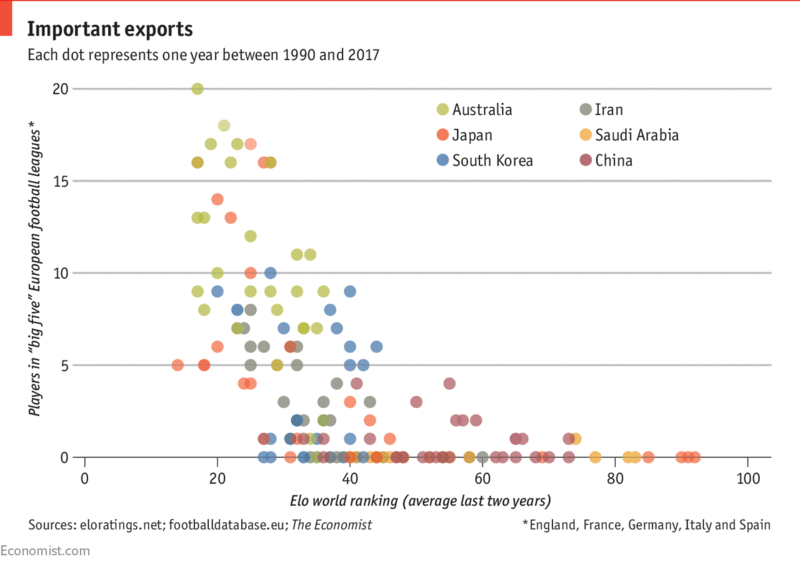 Furthermore, the decline or stagnation of big-five-league exports has been a trend across the continent. Australia had 18 such players going into the 2006 World Cup, but has only seven today. Iran’s tally has fallen from seven to one, China’s from two to zero and Saudi Arabia has yet to break its duck. South Korea has achieved a modest improvement, from six to eight. Only Japan has really kicked on, with 16 players currently in big-five leagues, up from five. Asia’s footballing nadir came at the last World Cup. Whereas five North American and African sides made it to the knockout stages, all four AFC teams came bottom of their respective pools, without recording a single win between them in 12 matches. Such a failure must have seemed unlikely in 2002 when Japan and South Korea shared the hosting rights of the World Cup, putting on a popular and well-run event that proved Asia’s appetite for the game. Both teams went on successful runs. Japan topped their group. So did South Korea, who benefited from some questionable refereeing decisions on their way to the semi-finals—the United States in 1930 are the only other side from outside of Europe or South America to have reached that stage. South Korea were only denied a place in the final by a late German winner. At that point, further glory must have seemed inevitable. Yet in the intervening years no Asian side has won a knockout tie at a World Cup. What went wrong? FIFA does not release official participation data for national associations, but the continued strength of the brands of European clubs in Asiasuggests that the enthusiasm for the game has not dwindled. A more obvious cause is the lack of regular competition for the continent’s top sides. Tom Byer, an administrator who has worked with both China and Japan, has argued that the gap between the stronger nations and the rest makes qualifying too easy and the step-up to the World Cup too great, a problem that will persist “until we, Asia, the AFC, can start developing some of these other teams, these fringe countries that are starting to break through”. All continents have one-sided qualifying matches, as fans of Gibraltar or San Marino can confirm. But teams from outside of Europe and South America get too few opportunities to test themselves against the best. In the past two years, Iran have played just two games against a team from either continent (Macedonia and Montenegro), as have Japan, South Korea and China. African sides suffer from this problem too, and find themselves lower down the Elo rankings, with their strongest teams in the high thirties. But they at least are producing plenty of talent: Nigeria, Côte d’Ivoire, Ghana and Senegal all have between 14 and 21 big-five-league players. North American nations, meanwhile, are benefiting from closer integration with their South American cousins. Last year’s centenary edition of the Copa América featured both continents, and the United States and Mexico are rumoured to be among the invitees for an expanded tournament in 2019. Japan and China have also been suggested as possible entrants for the competition. Such opportunities are crucial for the development of Asian football. Without them, the continent might drift for another 15 years. Mr Xi hopes that China will be able to compete at the highest level by then, since he expects it to become a “world football superpower” by 2050. Developing the requisite talent will be hard. But without regularly challenging themselves against the likes of Brazil and Germany, rather than Bahrain and Jordan, the effort might be futile. Correction (June 15th): An earlier version of this piece suggested that South Korea are the only side from outside of Europe or South America to have reached the semi-finals of the World Cup. In fact, the United States did so in the inaugural tournament in 1930. This has been corrected.